It’s hard to believe the first quarter of 2019 is already done! But with the last trading day of March behind us, it’s time to focus on April and the start of Q2. And in my opinion, the big picture backdrop really does imply we’re at an interesting point in the price action. So let’s quickly take a look at what the indexes are doing before pivoting into individual charts. Alright, to set the stage let’s first recap what some of the different asset classes have been up to. This can provide great context for looking at specific stocks. So let’s dive in! You can see dip buyers stepped in throughout this most recent month, and managed to close out March on a high note. And you know what? Considering the strength we saw throughout the first quarter, it’ll be very curious to learn if the turning of the calendar this week does anything to change the price character. I know it sounds a bit silly. But remember the October 2018 decline started right after the quarter turned too. So keep an open mind that we could see a change of pace. For now though, the long-term trend appears to still be up. Or at least, not down. Because from the weekly chart view, you can also kind of get a sense for a mixed outlook. It’s not that the indexes are moving backwards or anything. But they’ve been doing a little back-and-forth at current levels. And if you think about it, this kind of make sense. After all, stocks dropped very quickly last fall. 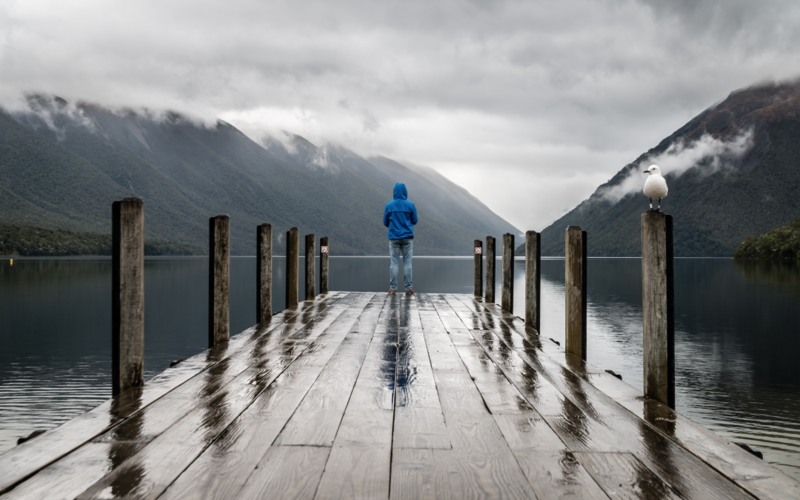 So there are probably a lot of buyers who are still underwater on some of their positions, and only now starting to get even. It makes sense some may consider lightening up their exposure. Plus, with an apparently dovish federal reserve, bonds are really boogying as interest rates fall. At the same time, oil also continues to grind higher and higher. So alternatives to stocks may offer some appeal (and thus competition). But when I zoom in to the daily timeframe of US large caps, I think it’s hard to argue the recent price action hasn’t been constructive. While we’re still below all-time highs with a flat 200-day moving average (indicating lack of trend), the recent pullback did appear pretty orderly. The rounded bottom and strong finish to the week were encouraging steps for bulls. And don’t forget how sharp the bounce has been throughout Q1 as a whole. I think this past week’s price action feels pretty reasonable when you consider that context too. Meanwhile outside the US, things continue to hold up well. 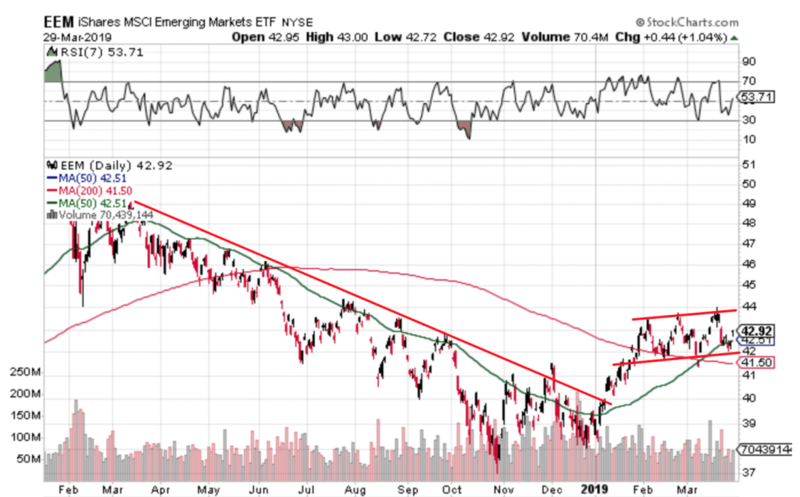 Emerging markets (including fast-moving Chinese stocks) have held the line at support pretty well. Here’s a longer-term daily chart which paints the picture pretty well. On the whole, I’m quite encouraged to see these ex-US stocks acting better than they did in 2018. 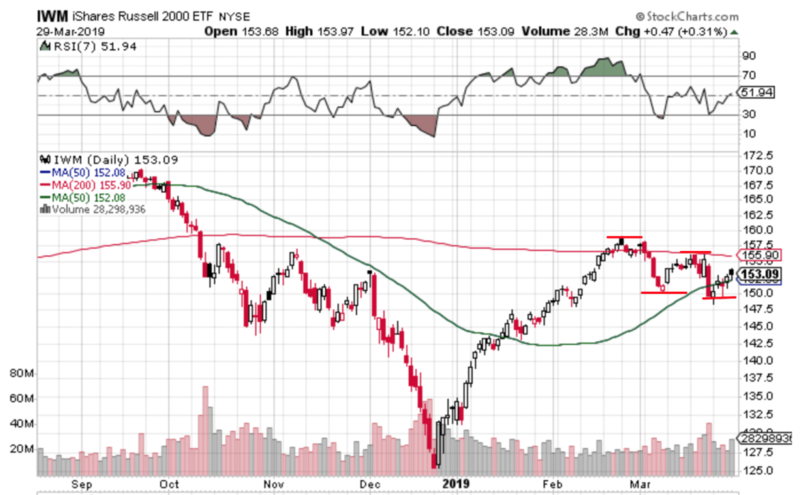 I think their underperformance was a headwind for global equities as a whole, and I’m keen to see if this prospective uptrend can put in another leg higher. 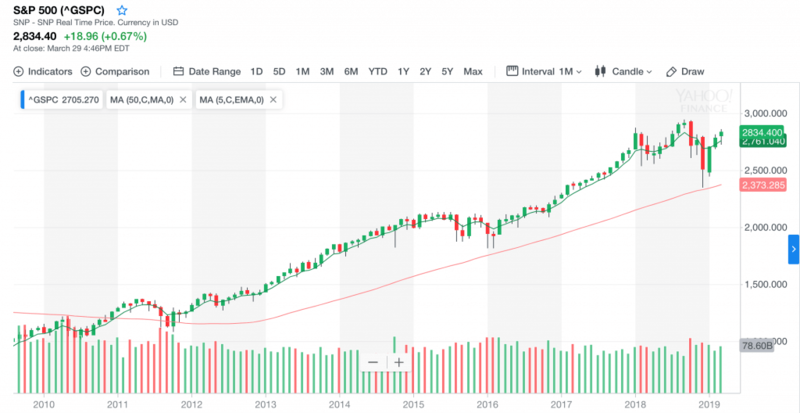 Unlike many of the leading groups of the market – tech stocks in the Nasdaq 100 and large-caps in the S&P-500 – the small caps have failed to get above their February highs. In fact, they’ve actually made lower highs, throughout the month of March. I feel like a little bit of a broken record here but, small caps led us lower in October 2018 so I’m going to get more cautious in a hurry if we do end up seeing a breakdown in this group. But until that happens, I’m going to keep looking for setups on the long side. So let me show you a few charts that have my eye at the moment. 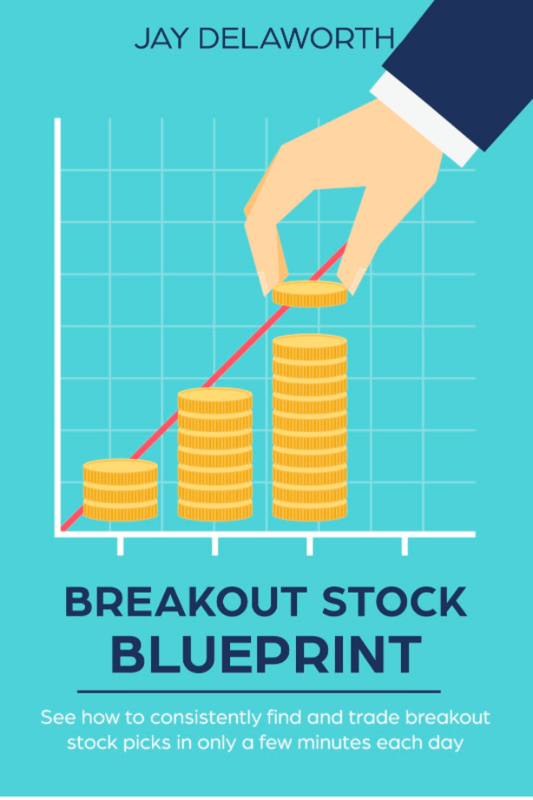 With large parts of the market hitting new highs, there are still lots of stock that are acting well. 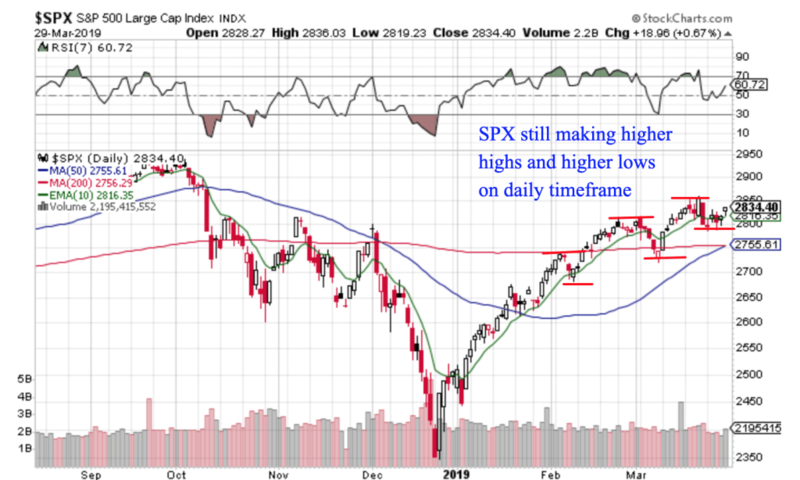 And after a couple weeks of back-and-forth, there are more stocks that are setting up again yet not looking so extended. So first, I want to review a couple of my current holdings that have perked up again and are flashing fresh entry signals. 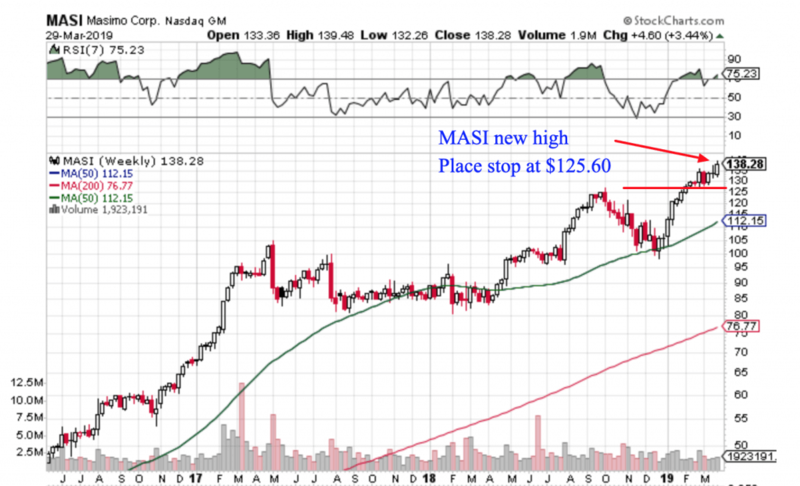 First, Masimo Corp (MASI) is at it again after a couple of weeks of consolidation at 52-week highs. 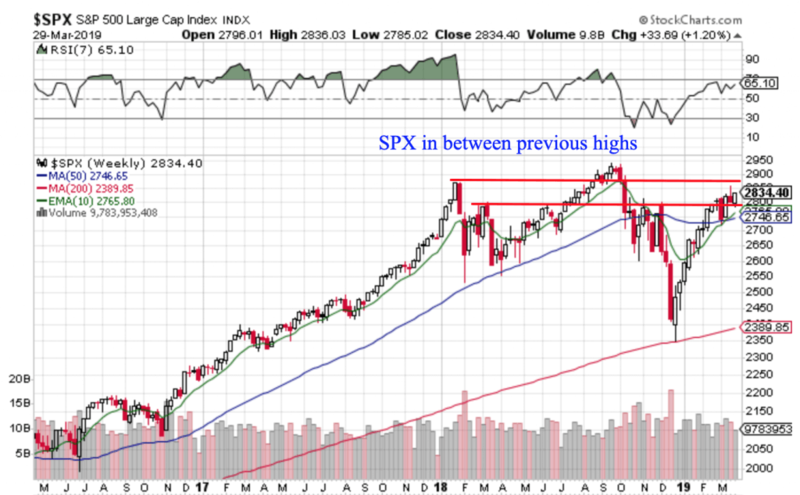 With this new weekly closing high, I’m encouraged the stock could be getting ready for another leg higher like it had back in 2017. 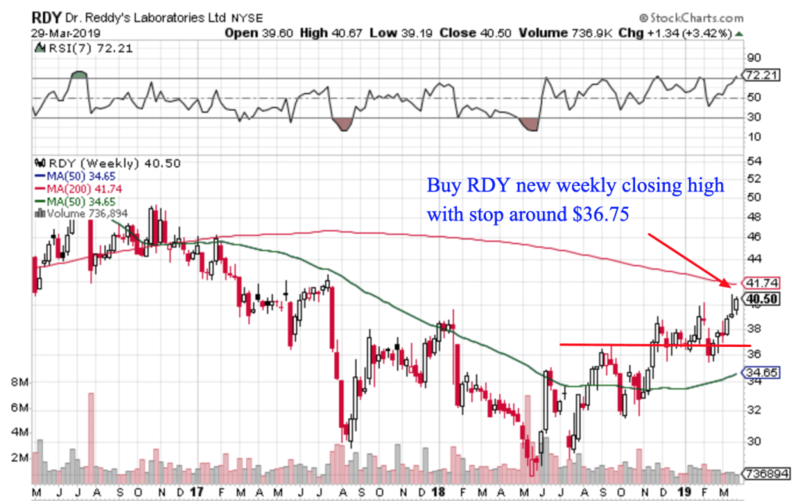 Now another holding of mine, Dr. Reddy’s Laboratories (RDY) is also at 52-week closing highs. I like the potential bottom here and with emerging markets holding up, this volatile stock is looking intriguing. As I said though, this is a volatile ticker so I’m keeping a somewhat wider stop loss and trading off the weekly charts. 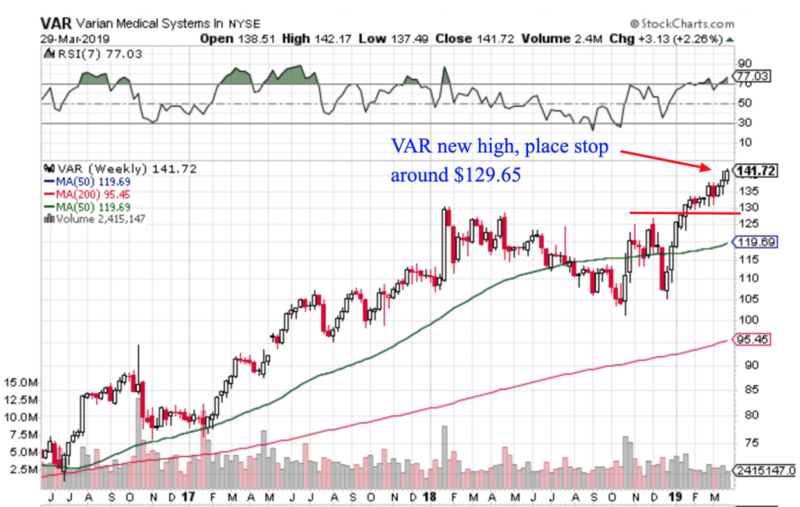 Now as for a couple of new ideas, one stock that’s on my radar is Varian Medical Systems (VAR). I like the structure of the chart here and similar to MASI, I’m curious if this one can get running again. The healthcare sector as a whole has been consolidating a little bit in recent weeks. But under the surface I’ve noticed a number of charts that are acting well. So I’m also hoping for a possible top-down tailwind to help get this idea going. 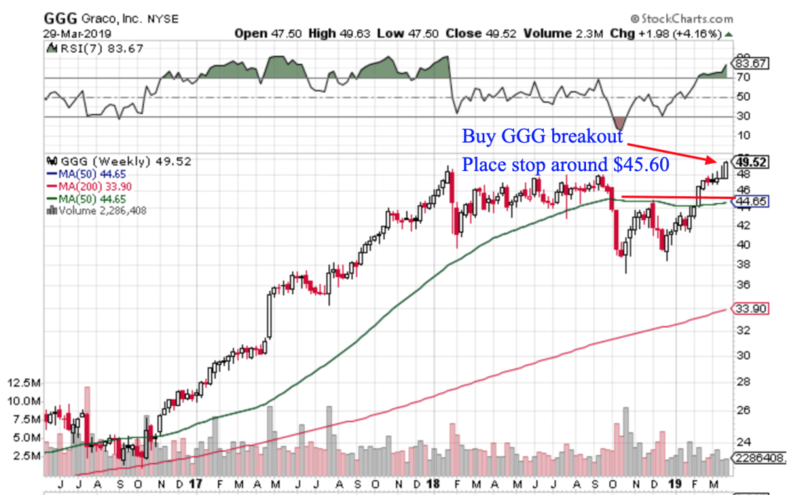 Finally, one of my favourite charts out there right now is Graco Inc (GGG). This might be because I’m biased, since I’ve had some nice trades in this one in the past. But I like the strong weekly close after weeks of tight consolidation. With GGG at the highs, I’m hoping it can get moving again for another leg up. After all, this stock has basically gone sideways for 15 months. It’s reasonable to believe that base could justify a larger and longer uptrend.